If your family is anything like mine then pizza night is a weekly occurrence! If you are pinching pennies or want something a little different, this is a great option! It’s a fun activity for you to do as a family, the kids love adding their own fillings. Roll dough out relatively thin. Spread a very thin layer of pizza sauce over the dough (I make my own, but store bought works good too) sprinkle shredded mozzarella cheese over the dough leaving about a 1/4″ around the edges. Layer your pepperoni or whatever else you like for toppings (I find simple is best) Carefully roll it up from the long end. Tuck the ends under and pinch the seam that runs down the middle. Cut small air holes about 2″ apart along the top. Brush with olive oil sprinkle with a LITTLE garlic salt (optional). 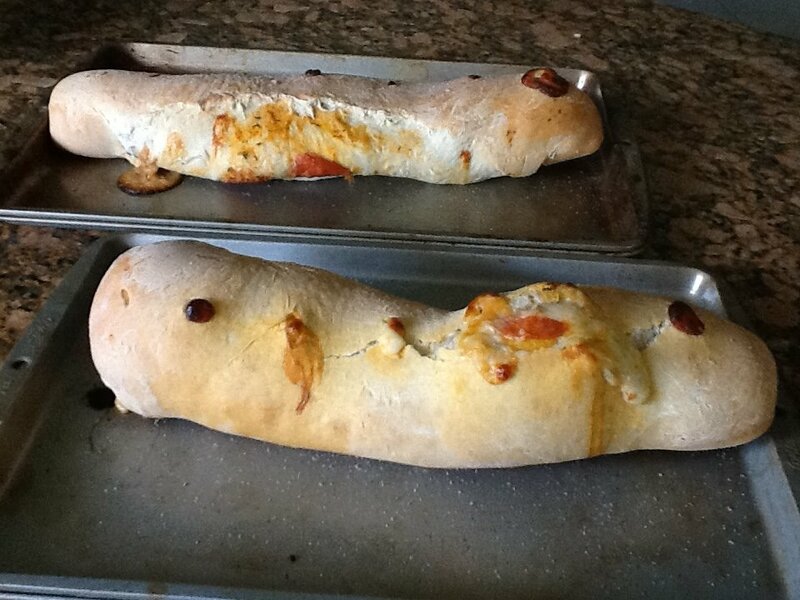 Put on a baking sheet and bake at 400 for approx 20mins until the Stromboli is golden brown and the cheese is bubbling out!! Let it sit for about 5 minutes before cutting it. This entry was posted in Favorite Recipes and tagged 30 minute meal, dinner, quick dinners. Bookmark the permalink.